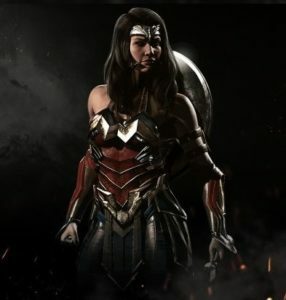 This page contains a character guide for Wonder Woman in Injustice 2. Here you’ll find movelists, combos, juggles and strategy guides and recommended gear for the Hero character. For more Injustice 2 content, head over to our Injustice 2 top page. Daughter of the Amazon Queen and the Greek God of Thunder Zeus, Diana was trained by the Amazons and the Greek God of War Ares. Armed with magical weapons and one of the most formidable warriors on Earth, Diana fights to protect the innocent. The daughter of the Olympian god Zeus and the Amazon Queen Hippolyta, Wonder Woman is one of the most powerful demigods alive, boasting superhuman strength, durability, stamina, and speed, all at least on par with Superman, with Diana also possessing the power of flight and godlike longevity due to her status as a demigod. When Wonder Woman combines her natural powers with the skills and training she received from her time raised among the Amazons of Themyscria, her skills allow her to overcome opponents even more powerful than herself, as seen when she defeated Superman in a one on one fight. Meter Burn R2 (must press R2 in the middle of Lasso of Truth). Bracelets of Submission allow Wonder Woman to parry projectiles and basic attacks. Successfully parrying an attack will give Wonder Woman a short damage buff. Must have Hermes’ Blessing active to perform Air Dash Forward. Must have Hermes’ Blessing active to perform Air Dash Away. Activating Hippolyta’s Light will randomly select one of five different buffs. Wonder Woman takes reduced damage. Increases the duration and power of the buff after Bracelets of Submission. Increases the damage of Shield based attacks. Allows Shield Toss to absorb projectiles while the buff is active. Increases the damage of Lasso based attacks. Allows Wonder Woman to Air Dash Forward and Air Dash Away. Below are combo and juggle inputs for Wonder Woman, including corner strategies and restarts. Wonder Woman wears a strapless red bustier held up by a brace of gold resembling an eagle with a star. She has a gold belt with a star on it and blue briefs with white stars on the side. She has blue tights and red boots with white stripes on the front that turn into wings at the top. She also wears her silver bracelets of submission on her wrists, her golden tiara with a red star on her forehead, her golden lasso which hangs from her belt when not used, and her sword and shield which stay on her back when not in use. Wonder Woman retains her sword, shield, and lasso. She has a red one-piece leotard held up by a modified brace of gold resembling an eagle. She has a large golden belt that also resembles an eagle. She sports golden Amazonian armor which she wears on her forehead, shoulders, and arms. She also has knee-high greaves with white stripes that go up to her shins. Susan Eisenberg previously voiced Wonder Woman in the Justice League animated series, Superman/Batman: Apocalypse, DC Universe Online and Justice League: Doom. Wonder Woman has some unlockable abilities as well as the ones you posted here. Do you have any info on how to acquire those? I have her at level 20 but I still don’t have them even after completing many Mulitiverse missions.